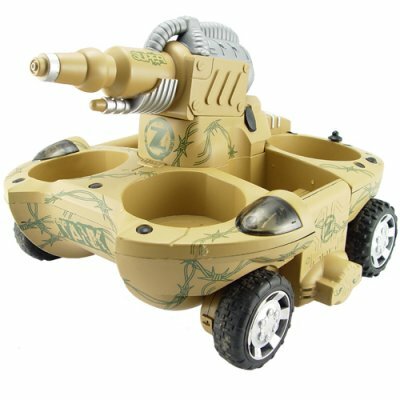 Successfully Added Transforming Amphibious Tank with Water Cannon and 4WD (110V) to your Shopping Cart. Transforming Amphibious Tank with Water Cannon and 4-Wheel Drive. Conquer land and water in style. On land, in water, under your boss's desk! Take fun, excitement and a little mischief with you wherever you go. This RC Amphibious Tank lets you drive over land and plow through water all while squirting your friends and foes with the water cannon. On the move? With the tank's powerful 4-wheel drive and independently controlled left and right wheels, you can get where you're going in a hurry and pull off 360-degree spins on the fly. Ready to take the plunge? Drive straight into your nearest river, lake or swimming pool, fold up the wheels, fire up the twin propellers, and zip through the water! Got a target in your sights? Fill up the water cannon before you do battle on land, or simply attach the 82-cm long hose when you're in the water. They'll never know what hit them! Buy a few for resale, give one as a gift, and be sure to keep one for yourself! This Amphibious Tank is offered to you at a low wholesale price from the leader in the coolest factory direct electronic products, Chinavasion. Want to battle your friends? Be sure to check out our other Amphibious Tank: CVGN-T12. The default charger for this product is for 110V. If you need a 220V power adapter then order CVGN-T10-220V. How do I change from land-mode to water-mode? Just hold the "Transmutation" button on the controller until the wheels are locked into place. It takes only four seconds to transform from one mode to the other. Is this Remote Control Amphibious Tank completely waterproof? No. This tank floats and drives in water, but the top of the tank should not be submerged in water. How do I steer? On the controller, the left button controls the left wheels and propeller, and the right button controls the right wheels and propeller. This gives you greater power, greater speed, and greater maneuverability. Can I drive this Amphibious Tank in salt water? No, salt water will damage this tank. Please enjoy this Amphibious Tank in fresh water only.